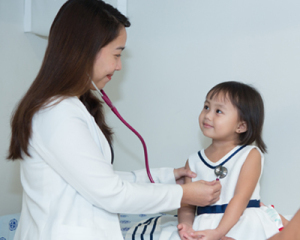 Every child is a gift from God, and the Pediatrics Department of the Manila Doctors Hospital helps ensure that children are given proper care and provided the best medical attention. Staffed by some of the country’s most sought-after pediatricians employing the latest medical breakthroughs and approaches in the diagnosis and treatment of illnesses and disorders among children and pre-adolescents, the Department is well-equipped to deal with a variety of medical conditions. Aside from the Pediatric Intensive Care Unit, the Department also runs the Neonatal Intensive Care Unit (NICU), a specialized area for newborn babies requiring intensive care. While healthy newborns are immediately roomed-in with their mothers, those who are sick or born with congenital anomalies that prevent them from rooming-in are taken care of in the NICU. As an accredited “Mother-Baby-Friendly” Hospital and an advocate for breastfeeding, the Department of Pediatrics is in the forefront of the hospital’s efforts to enhance access to quality care for children and their families as well.